My Place on Canvas: nominate WW landscapes for Rod Coyne to paint. “I couldn’t see it coming at the time, but what started out as a common or garden solo exhibition has turned into a major project with no end in sight” – Rod Coyne. The My Place on Canvas 2017 Calendar is just the latest by-product of an over active artistic imagination. What started out as a homage to Wicklow landscapes has turned into a celebration of people, memories and stories documented through a compelling mix of videos, words and paint. The My Place on Canvas is a project where the public nominate their favourite Co. Wicklow landscapes for artist Rod Coyne to paint. This culminated in an exhibition at the Tinahely Courthouse Art Centre in 2014. Throughout 2015 Rod continued to solicit and paint nominations of cherished Wicklow landscapes. This led to exhibitions and workshops with the Heritage department of Wicklow County Council and the Hollywood Fair. And in 2016 planning started the book to be published in 2017/18. And in the meantime the 2017 Calendar has been published along with a range of Wicklow Landscape canvas prints. 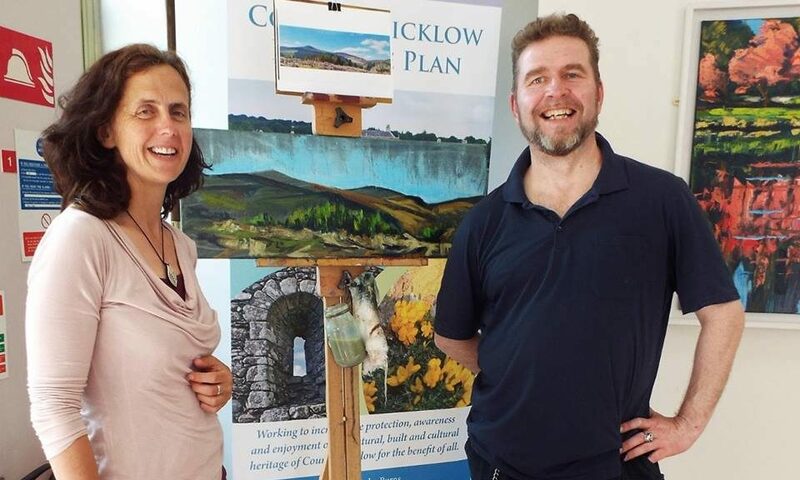 My Place on Canvas at Wicklow County Buildings – Rod Coyne with heritage officer Dierdre Byrne. CALL TO ACTION – then and now. This is your chance to be part of this project by nominating your favourite Wicklow landscape to be immortalised in paint and print. You just need to share some details about your “My Place” and Rod will do the rest. There is no charge for taking part and it is open to everyone. So if there’s a place close to your heart and you’d like to share it with the world then contact Rod Coyne. TO TAKE PART: Website: www.rodcoyne.com/myplace complete the questionnaire online. 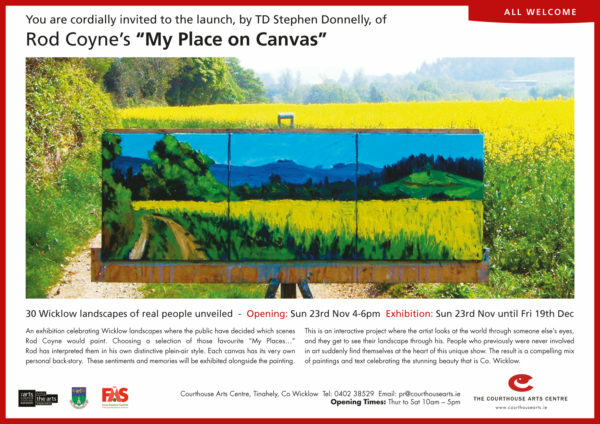 “My Place on Canvas” An exhibition by Rod Coyne, will be opened by TD Stephen Donnelly on 23rd November 2014. 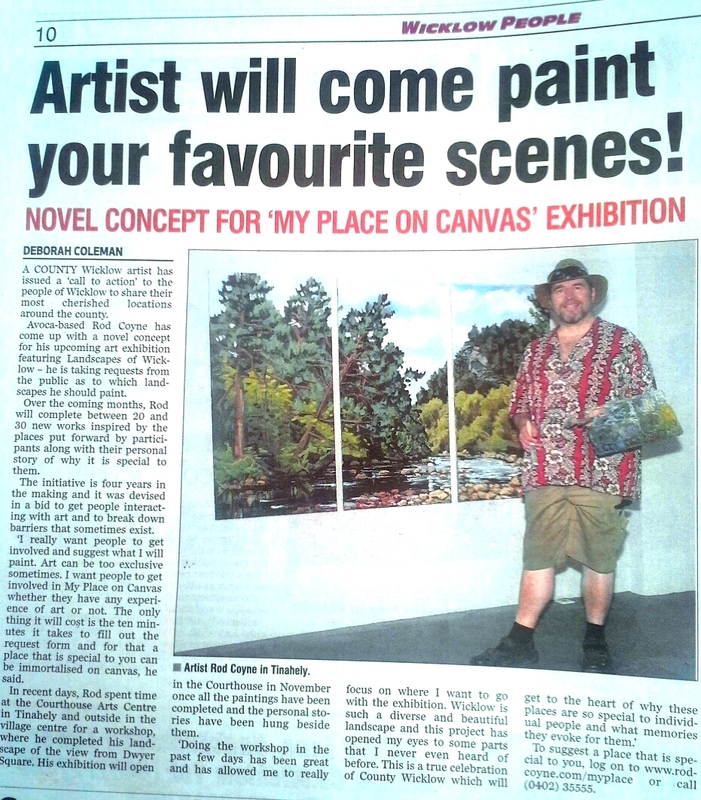 Rod Coyne paints sentiments and memories En plein air*. His upcoming exhibition at the Courthouse Tinahely is a singular mission to capture the favourite Wicklow scenes of others. Rod has motivated people to consider and articulate their relationship with their landscape. Then he has retold that story through paint. The result is a compelling mix of paintings and text called “My Place on Canvas”. Notable are contributions from author Paul Howard aka Ross O’Carroll Kelly, former Ireland rugby international Shane Byrne, lawyer to the stars Dr. Gerald Kean and Irelands most respected TD Stephen Donnelly. This multi-facetted undertaking saw Coyne marching from the mountains to the sea, or flanked by deer in the forest at dusk, and lunching with The Hon. Garech Browne in Luggala estate. “My Place on Canvas” is an exhibition celebrating the Wicklow landscape, where the public decided which scenes would be painted. Choosing a selection the artist then interpreted each in his own distinctive plein air style. The finished paintings will be displayed alongside the text of its very own personal back-story. The exhibition is the culmination of a three year long project which has captured the public’s imagination. Rod set out to break down some of the barriers and exclusivity that still exist around art. With this interactive project Coyne looks at the world through someone else’s eyes while they get to see their landscape through his. The result is a compelling mix of paintings and text broadcasting the majesty that is Co. Wicklow. Excitement mounts as all contributors anticipate their landscapes being publically unveiled for the first time. The exhibition will be opened by TD Stephen Donnelly on November 23rd. “My Place on Canvas” has allowed people who were previously never involved in art to find themselves at the heart of a fine art exhibition. There have been over 70 submissions from around the world including Holland, Scotland, the Czech Republic, Hong Kong and, of course, Wicklow. The artist received submissions from across the board including politicians and prisoners, celebrities and writers. All share a passion for the Garden County of Ireland, as the 30 new works being premiered will testify. In art we can find common ground, and in Rod’s hands it becomes universally accessible. In an effort to de-mystify the creative process Rod has been documenting his painting journey through a photo diary on Twitter. He has also filmed the realisation of each piece with a head-camera and these YouTube clips will be on display at the Courthouse Arts Centre. They tell the other story, that of Rod’s experiences and adventures as he wandered the county, bringing art outside, finding and painting other people’s visions of Wicklow. *En plein air is a French expression meaning ‘‘in the open air’’ referring to the act of painting outdoors. Plein air artists like Rod capture the spirit and essence of a landscape by incorporating the changing natural light, colour, and movement into their works. They need to capture that movement-Mother Nature does not stand still during the course of a day! Paint, Irish Whiskey plus Botany at Tourin House.